Prior to the collapse of Russia in 1917, vast quantities of military supplies had been assembled in the northern part of that country at the ports of Archangel and Murmansk, the latter being an open port north of the Arctic Circle. The Supreme War Council believed that Allied troops should be sent to secure these ports for the use of the Allies and to save the supplies located there. The original objectives also included the establishment a rallying point for Czech troops who were roaming loose in Russia and to prevent the establishment of German submarine bases. Consequently an Allied force under British command was dispatched by sea and on August 3, 1918, seized the city of Archangel and drove the Bolshevik troops to the south of that place. The first American troops ashore are fifty sailors from the USS Olympia. The British government had previously urged the United States to contribute a contingent and as a result the War Department directed the Commander-in-Chief of the American Expeditionary Forces to send three battalions of infantry and three companies of engineers to join this Allied venture. The 339th Infantry, 1st Battalion of the 310th Engineers, 337th Field Hospital and 337th Ambulance Company, all of the 85th Division, were designated. They sailed from England, and arrived in Northern Russia on September 4. Operating under British command, the American soldiers soon partieipated in the fighting, their first casualties occurring on September 16 in the general area to the south of Obozerskaya. 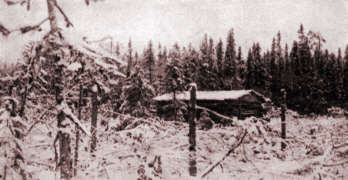 During their service in Russia the American troops conducted many small operations under arduous conditions, the normal hardships of warfare being intensified by the deep snow, intense cold, darkness of up in isolated detachments protecting, winter in the Arctic Zone and the long lines of communication, which were in constant danger of being cut by the enemy. 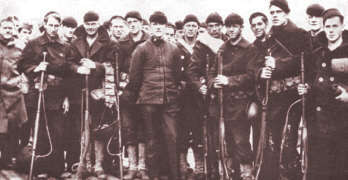 The small American contingent was soon split with Allied troops and Russian volunteers guarded the vital points on the railroads and rivers which were the main avenues of approach to the coast. During January 1919 the Bolsheviki launched an offensive northward between the Dvina River and the railroad, forcing the evacuation of Ust-Padenga, Shenkursk and Shegovari after heavy fighting, This caused the Allies to establish a new line of defense, and in garrisoning it the American forces became more widely dispersed than before. In March severe fighting developed around Bolshie-Ozerki and on May 1 a long-threatened attack in the vicinity of the Vaga River, 18 miles southeast of the town of Bereznik, was beaten off. 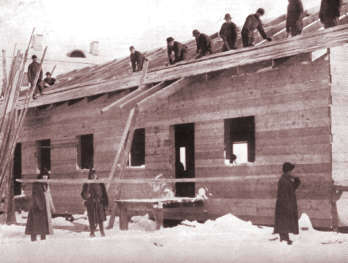 During April 1919 the American 167th and 168th Railroad Transportation Companies joined the expedition, operating mainly in the Murmansk region. After performing valuable service they were returned to France three months later. The American soldiers began to be withdrawn from the forward positions late in May 1919. They were assembled at Archangel and soon thereafter sailed for France, being replaced by British troops newly arrived from England and by Russian soldiers. On August 5 the headquarters of the American force in Northern Russia was officially closed. In the opinion of the senior American officer the expedition was not particularly well managed and his troops were subjected to needless hardships. 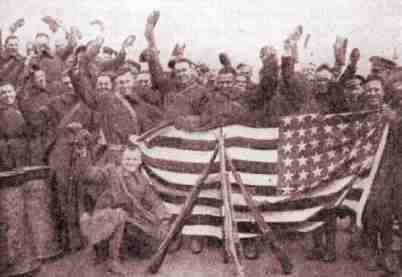 More than 400 casualties were suffered by this small American force, most of them occurring after the lighting had ceased on the Western Front. In spite of this, however, and the trying nature of their service, the American units performed their duties with great fortitude and bravery.